that will get your kids outside to play! I'm giving away a $50 Magic Cabin Gift Card! Magic Cabin offers the most unique playthings for children. Designed to spark imagination and encourage creative play, Magic Cabin's amazing product line includes toys, games, arts and crafts, dolls and fairies, and so much more. They even have a line of exclusive items you can't get anywhere else! I received the Fairy Tree Stump Stool from Magic Cabin and it's the cutest thing in my entire garden! It looks just like a big old tree stump, and features a little door with tiny steps and a sign that says "Fairies Welcome" on the front door. There are even two small windows on the front. The detail is simply incredible! The Fairy Tree Stump Stool is very sturdy and durable with a wide base and heavy construction. I've found that it easily holds an adult's weight and didn't tip over or move when my neighbor's son jumped off of it. Not only is it a wonderful place to stop and rest, it ignites children imagination. The Fairy Tree Stump Stool measures 21 inches high, 21 inches wide, and 23 inches deep. It can be used indoors or outdoors. The top of the tree stump even features realistic tree rings. Even though my own children are now grown, I know my future grandchildren will love discovering that fairies and pixies have a home in my garden. Visit Magic Cabin at www.magiccabin.com to find childhood's purest treasures. Follow Magic Cabin on Facebook, Twitter, and Pinterest so you're first to know about special sales and new products. They are always creating wonderful new products that encourage kids to come out play! 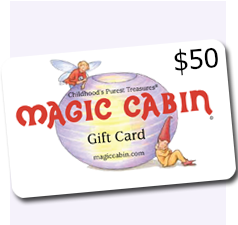 Win a $50 Magic Cabin Gift Card! To enter, just fill in the giveaway form below. This giveaway is open to US residents ages 18 and older. The giveaway will end at midnight on June 15, 2015. Good luck! I would get the Beeswax Candle Rolling Kit. Thanks. I would love to get the Pirate Ship Tent, it's adorable and I can see the kids playing in it for hours. Thank you. Oh I love this website! My favorite thing right now is the Rustic Wooden Tree Fort! I like the deep space planetarium projector. My son would really enjoy the Pulley Set with Wooden Reels and Nylon Ropes. I would get the LED Purple Starlight Bower for my daughter. I'd get the Felt Penguins and Igloo Set. I would love the LED purple starlight bower! It's so pretty! I am in love with the Fairy Houses! I would maybe get my daughter the Double Swing since we had to get rid of our swingset. Thank you!! The 1-2-3 Grow With Me toy is really cute! I might have to get the Fanciful Fabric Butterfly Dress with Wings for my daughter! Gorgeous! Courtney hennagir on rafflecopter,courtafi2138 at gmail dot com. 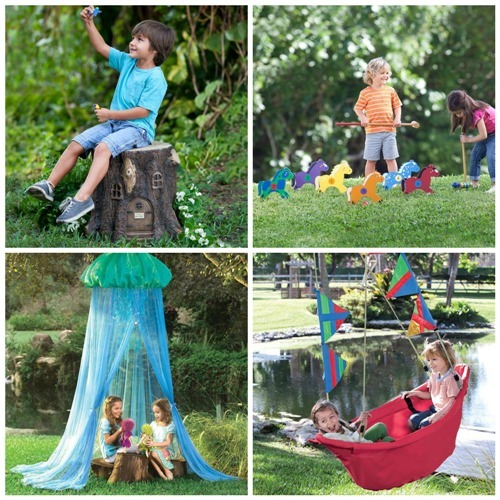 Fairy Playtime Teepee so cute the kids would love playing in this one! I would get a couple Hop Balls. Those are so much fun. I might get the super water slide, all of my kids would love it! I would get each of my grandsons an aroma pillow to help them relax at night and get to sleep better. I would get the New! Magic Carpet Swing its so cool. Oooh there's so much great stuff!! I would either get the nutty ball track or the sheepskin or the rock a bye swing?! Ah I can't decide!!! I would get the Wee Enchanted Garden Set. I love the ladybug nature swing. I think I would get the Sparkle Fairy Wings Lounge Pillow for dd! I might get the Spinning Seesaw for my grandsons to enjoy! I might get the Large Lap Loom, thanks for the chance! I might get the adorable Two-in-One Game Set. It looks like it would be tons of fun. I love the rocking seesaw for my kiddos. They would love it too. Thanks for the chance. I might get the Fairy Houses. I would probably get the Rocking Seesaw if I won thanks for the chance to win. I'd love to get my daughter the Little Reader Chair! I love the little fairy houses. We would probably get the Illuminated Tabletop Globe with Color-Coded Topography and Sturdy Wooden Base. This would be great for our homeschool. I would like to have the Cuddle-U Adjustable Nursing Pillow with Attached Seat Wrap. Forest Friends Domino Set for my son would be something i could get with the gift card. I might get the Little Readers Deluxe Chair if I won. Oh I really love the Magic Carpet Swing! So many great products, made it really hard to pick! I would love to have the Mushroom Fairy House and the set of 5 fairies for my garden! I like the Waste-Free Reusable Lunch Kit and Snack Packs. They would be great for work or school. I would select a seesaw! My daughter would love the Indian dress up kit or some new craft supplies. I might get the magic carpet swing. So cute. I'd love to get some of the whimsical backyard decor. I'm in love with the Woodland Fairy House! It's gorgeous! I'd put it towards the Cozy Posy Nature Haven HugglePod® HangOut. I would get some Butterfly Solar Lanterns. I'd love to get my kids the Neptune's Treasure Float! How fun! I would purchase the Super Water Slide for my kids to play on during the summer. I would love the wooden sand and water table for my kids! So many awesome things! Maybe the cherry tree blocks set? I really like the rocking see saw. It looks like great fun. I can see my household getting a ton of use out of the Sack Race Bags! !